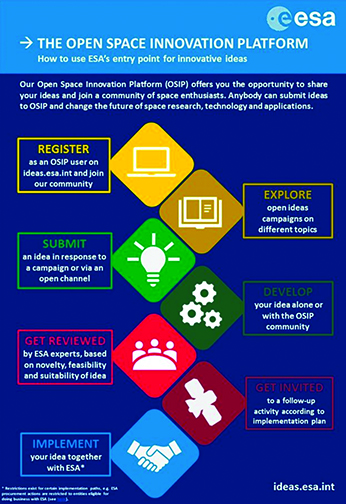 ESA aims to harness a new resource for future space activities: ideas from European researchers, businesses and the general public — through the organization's new Open Space Innovation Platform (OSIP), anyone is welcome to respond to space-related challenges. ESA Director General, Jan Wörner, commented that through OSIP, ESA hope sto build and nurture a community of space technology enthusiasts, enabling people to inject their insight into the ESA and collaborate smoothly with ESA experts to contribute to the future of the Europe in space. OSIP will challenge users to propose new ideas to address specific problems in form of thematic campaigns. The site currently hosts two such public challenges, both linked to the oceans, as well as a channel to submit ideas for co-sponsored research. Methods to enlarge the effective area of autonomous shipping – today heavily reliant on satellite navigation – into heavily-trafficked ports requiring precision navigation as well as the high Arctic, where satellite navigation is rendered less reliable. Another OSIP channel calls on ideas for research projects without a specific theme. These novel space-related research proposals would be co-funded by ESA. While the two campaigns have deadlines, the channel is open ended with rolling evaluations and selections. ESA’s first contact with new ideas typically comes through the Discovery element, which also includes the Advanced Concepts Team (ACT), the Agency’s future-oriented think tank staffed with a rotating roster of Ph.D. researchers. Initial studies are typically system studies, asking: if we incorporate this innovation into a space system, what would it enable, how could it work in practice? The next stage is the Agency’s Technology Development Element, similarly active across all sectors of space. This is dedicated to creating the first laboratory prototypes of new ideas to demonstrate they are ready to be taken further by follow-on programs, such as ESA Science’s Core Technology Program, the ARTES Advanced Research in Telecommunications Systems program or the General Support Technology Program, readying technologies for spaceflight and the open market. The goal of ESA’s seamless chain of innovation is to have a steady stream of new technologies ready for take-up by ESA missions and programs — making the correct discoveries available at the correct time as missions and applications require them.